Blogger is a blog publishing system, which was created by Pyra Labs in 1999, and bought by Google later in 2003. By May 2007, Blogger had completely moved over to Google operated servers. With Photo Slideshow Maker, you can create gorgeous photo flash slideshows, and then insert the PFM-generated flash slideshow to Blogger. You can start posting text, photos, videos, and more to your blog. In addition, Blogger includes an HTML editor that lets you fully custom the look and feel of your posts. Creating flash slideshow for Blogger is as easy as creating your blog with Blogger, it takes just a few easy steps. Flash slideshows inserted to Blogger are actually hosted on Go2Album, the free online photo gallery dedicated to Photo Slideshow Maker users. There are plenty of basic and advanced flash templates for you selection. Choose the one that can better showcase your photos. You can add transition effects and music to the photo slideshows. When you proceed to publish the photo slideshow, choose the "Create Flash Files and Upload to Go2Album" option, and then follow the guidance to complete the publishing. 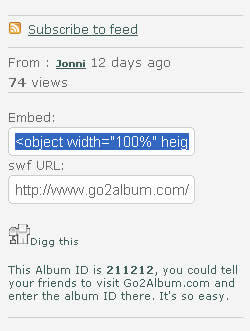 Publishing slideshows to Go2Album requires a user account. You may sign up to Go2Album if you do not have an account. After publishing the slideshow to Go2Album, you will be prompted to the slideshow page, in which you can find detailed information of the flash slideshow as showed bellow. Copy the HTML code for embedding the slideshow to other websites or blogs. In the blog editing page, click the Edit HTML tab, and paste the HTML code into the text field. You can preview if the flash slideshow is properly inserted.